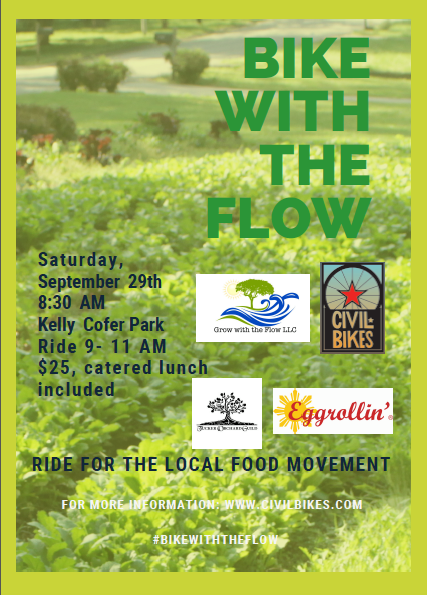 Grow With The Flow LLC is excited to partner with Civil Bikes on a tour of our Tucker market gardens. Come and learn about the local food movement in our community on Saturday, 9/29. The ride starts at 8:30 am at Kelly Cofer Park in the "Peach Pit" showcasing the Friends of Tucker Parks' Orchard Guild Ride from 9-11 am. Tickets are $25 and includes a catered lunch. Reserve your spot here.